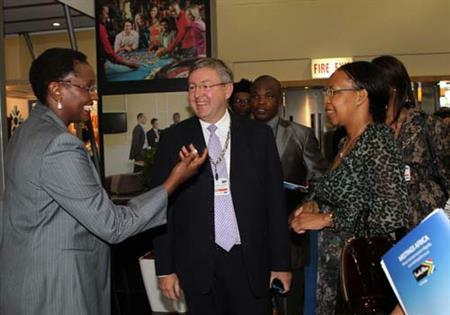 South Africa has launched a five-year plan to double the number of annual meeting delegates visiting the country from 141,000 to 210,000, following the creation of a new National Convention Bureau earlier this year. Speaking at Imex in Frankfurt, South Africa Tourism chief executive Thulani Nzima, said there is huge potential for South Africa to attract more corporate and association meeting business and boost the country's ICCA ranking from its current 37th place. "We believe these numbers are achievable," he added. South Africa announced the launch of the National Convention Bureau, headed up by Amanda Kotze-Nhlapo, at Meetings Africa in February. Nzima said the core focus for the new NCB over the next five years will be on the key markets it already has a presence, including the UK, Germany and other key European countries. This will include creating a clear brand message for South Africa as a business destination that is as strong as the country’s leisure brand. Kotze-Nhlapo added that another key focus is growing international association business in South Africa, both regional and international. What can South Africa offer associations?